During October 2016, McNick’s Rockets for Life Club sponsored a host of activities in recognition of the annual Respect Life Month. Among the activities sponsored by the club were Cupcakes for Life, the Pro-Life Poster Contest, and a Day of Silent Solidarity. “I felt…that we as high-schoolers and young people need to play a role in the [pro-life] movement because we’re the ones who are going to be trying to make the changes for the next number of years,” said Rockets for Life member Vinny Ramundo. One of the activities sponsored by the club was Cupcakes for Life. Club members passed out cupcakes to the student body during lunch on Oct. 10. The cupcakes stood as a birthday token for those children who never had the opportunity to celebrate one. Passing out the cupcakes also allowed the Rockets for Life to interact with the rest of the student body and speak with interested students. “It is a way to try to encourage people to join the club [and to] tell them about upcoming events,” said Rockets for Life Moderator Tracey Canisalez. “It also is symbolic of children who have never had a birthday – a sweet way of bringing awareness to abortion and the need for people to work for the cause,” she added. The Rockets for Life also sponsored a Pro-Life Poster Contest during October. Students participating were required to create a poster reflecting a theme of “Love Life.” Award-winning designs were submitted by senior Molly Jorden (first place), sophomore Brenna Threet (second place), and freshman Taylor Collett (third place). On Oct. 25, students participated in a Day of Silent Solidarity, refraining from speaking for the entire school day in remembrance of those people who do not have a voice. Those who took part in the reflection wore red duct tape to identify themselves as participants. “[The Day of Silent Solidarity] is a way of bringing awareness to our community and standing in solidarity with other students across our nation who are pro-life,” Canisalez said. Although the month of October has ended, the Rockets for Life are still active. On Saturday, Nov. 5, members of the club are participating in the Pro-Life Saver 5k Run-Walk being held at Lunken Airport Playfield. The event’s proceeds benefit the Cincinnati Right to Life Educational Foundation as well as the Right to Life of Greater Cincinnati. In the past McNick has been the largest group to participate in the walk, and the club is looking to repeat the accomplishment this year. 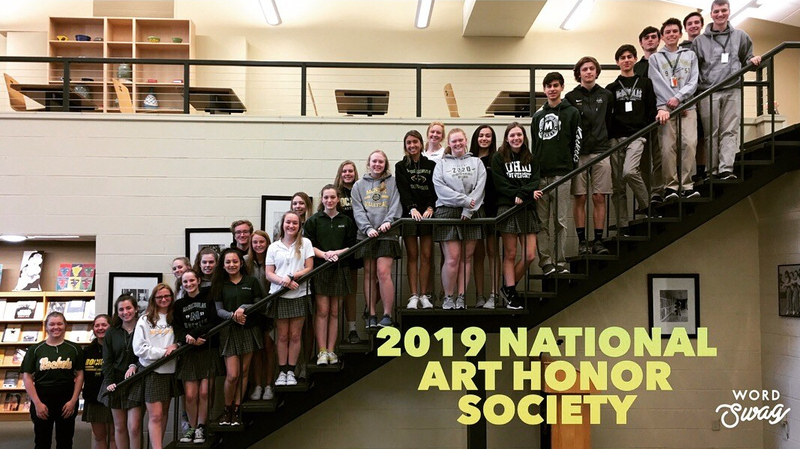 “There’s people from a whole bunch of different high schools and groups who go, and one year in the past…[McNick] was the biggest group represented there,” junior Isabella Daley said. The club will also hold a Baby Blanket collection in November to donate to Pregnancy Center East. With all of the different activities planned, the Rockets for Life are always open to welcoming new members. Current members talked about the importance of letting others know about the club. “Spread the word,” Ramundo said. “Anyone is welcome to join,” Daley echoed. Students interested in joining can talk to or email Spanish Teacher and Rockets for Life Moderator Tracey Canisalez at tcanisalez@mcnhs.org. The club usually meets on scheduled Wednesdays in Canisalez’s classroom. Senior Molly Jorden’s “Love Life” poster took first place in McNick’s 2016 Pro-Life Poster Contest. The event was one of the activities sponsored by the Rockets for Life Club during the month of October.